During my trip to Ohio and New York two weeks ago, I made virtually no paper photocopies or prints, and yet I came home with a considerable array of records. Traditionally, information-gathering of this nature would have resulted in numerous photocopies from books and documents, as well as prints from microfilm, costing a small fortune in the process (most archives charge between 25 and 50 cents a copy for letter-size prints, and as much as $2 a copy for 11 x 17 inch documents). Instead, I captured source records, whenever possible, using either a digital point-and-shoot camera or my portable Canon flatbed scanner. Instead of paying with wads of bills and pockets-full of change, I paid only in hard-drive storage space, which is a cheap and renewable resource, no doubt saving tens or hundreds of dollars in the process. Since this was my first research trip, my efforts to capture data digitally were somewhat experimental. I found that while I could easily capture loose-leaf letter-sized documents using my flatbed scanner, it was very difficult to get large volumes to lay flat enough on the glass to get a clear scan, especially since flatbed scanners have a fixed focal range that poorly handles object depth. For legal-sized documents, my flatbed scanner worked reasonably well, but since its scanning glass is only slightly larger than a letter-sized sheet of paper, I had to scan each document in two passes: the first pass to capture the upper three-quarters of the document; then, after rotating the document 180 degrees, a second pass to capture the remaining one quarter, and allowing a bit extra for overlap. For large documents, I found that using the digital camera in macro mode (which allows the lens to focus to within a few inches of the target), taking multiple images as I moved across the width of the page, worked reasonably well. The problem I faced when I got home was trying to find a way to stitch these multi-image source documents back together. That effort is still ongoing, and I am learning techniques through experimentation with different software packages. For the legal-sized pages, scanned with my flatbed scanner, the work is fairly simple. The digital images are straight, have a common focal range, and a fairly consistent amount of overlap. Windows Live Photo Gallery, a free tool downloadable from Microsoft, has a simple yet remarkably intelligent stitching capability which melds the two halves of legal-sized documents back together with no sign that they were ever anything but a single scanned image. For the images I took with the digital camera, however, the problem is much tougher. As I swept across a page taking multiple images, invariably my focal range would change slightly, as would the camera angle, lighting, and amount of overlap between snaps. For this task, I have been using some more-advanced stitching tools in Adobe Photoshop Elements 8. These tools allow me to reduce or eliminate variations in camera angle and even the small amount of "fish-eye" effect introduced by the camera's macro processing. To see an example of this, the death entry for William Aylard in my previous post is actually a compilation of three separate camera images that have been "normalized" by Photoshop Elements. I have included the three component images here so that you can compare (both these component images and the composite image in my previous post have all been reduced in size). After merging, I crop the resulting image to eliminate the mismatched areas along the edge of the merge. The result is reasonably convincing, I think. And as I work with these techniques more, I can use my gained experience to take better original images next time, ensuring better results with a smaller time investment, and even more saved cash. When I was in Medina County, Ohio, a couple of weeks back, I spent the better part of two days in the vault of the Probate Court. 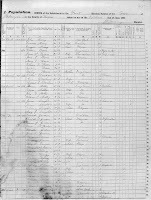 The County maintains birth, marriage, and death records, among other types of records, that were created prior to centralized records mandated by the state government in about 1908. 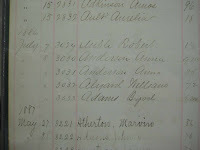 Many of these county-maintained records span the period of time when our Aylard ancestors lived in Brunswick. 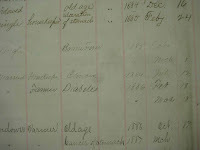 From family sources, I knew that William Aylard, my great-great grandfather, had died on 18 February 1886. I located his death entry (they didn't create death certificates in those days) in the Probate Court vault and found that he had died of diabetes at the age of 72. The setting sun, muted in Midwestern haze, bathed an endless patchwork of square fields in a soft orange glow as my plane descended from cruising altitude. Only the occasional river slithering carelessly across the landscape seemed to defy the uniformity below. As the plane arced out over Lake Erie in its approach to Cleveland Hopkins International, whitecap standard-bearers lead a formidable armada of waves far below. I wondered what my ancestors would think: the wild frontier that once lured them westward with the promise of open land, now mastered, just a few short generations later. And it was to better understand their movements that I came here: briefly to Ohio, at first, and then on to New York state. I did not expect to uncover any groundbreaking revelations, and so far I have not. But I hoped to begin to add some detail and color to the faint sketch of knowledge that I had. And I have gained some of that. My plane arrived Saturday evening, and after an overnight stay near the airport in Cleveland, I trekked 350 miles across the southern shore of Lake Erie, through a tiny strip of Pennsylvania, and into the heartland of upstate New York. My destination that afternoon was the small town outside of Ithaca where my father's cousin, Dr. Stephenson, held a trove of photographs from the Barr and Vore side of my Aylard heritage. He also has a storehouse of knowledge based on at least a dozen years in which he dug into the dusty shelves of old documents and reels of microfilm to do the same sort of thing that I am doing now. And he had some firsthand knowledge, as well, having spent time with his Vore grandparents, who are my great grandparents. Dr. Stephenson and I spent several hours scanning several large envelopes full of family photographs. Most of them had some level of identification associated with them, but others, sadly, did not. He thought his mother could have easily identified most of the mysterious faces that we could not. But as with many things, realizations such as this often come only when the opportunity is gone. Nonetheless, we scanned these anyway in the hope that perhaps one day I could identify some of them. One of my favorite photographs, for reasons that are not entirely clear to me, is one that I did not even conceive could have existed until just a few short weeks ago when I saw a copy of it in a PDF file that Dr. Stephenson had compiled nearly ten years ago. It is of my 2d great grandmother (my father's mother's mother's mother), Calista Samira Fields, who married my 2d great grandfather, John Hiatt Barr. Calista married John when she was barely nineteen, bore him five daughters and a son, and then died after a short illness at the age of forty-one. After spending the night in Ithaca, I drove north through the aptly named Finger Lakes region to the small town of Lyons, New York, the County seat for Wayne County. My 2d great grandfather in my direct Aylard line, William Aylard, migrated to the small community of Palmyra, about fifteen miles down the road from Lyons. I spent most of the day there in the office of the County Historian performing research into the 1855 New York State census, and into church records for three of the major churches that existed in Palmyra when William and his growing family lived there. I will try to provide more information about this visit at a later time, as I plan to return there again tomorrow for further research. Fresh from the post: I just received three death certificates (technically, Certified Copies of Entries of Death) from the United Kingdom General Records Office (GRO) for some Aylard ancestors. I had purchased these over the Internet about two weeks ago. One certificate is for John Aylard, a younger brother of my great-great grandfather, William (my genealogy software tells me that John was my 2d great grand uncle). Like William, and their father (also named William), John was a carpenter. However, the certificate verifies that John died in early adulthood, at the age of twenty-one, on 27 March 1842 in Soham. His cause of death was recorded as "inflammation of the lungs." Cross-referencing archaic medical terms, this appears to have been what we would call pneumonia. I think it is not at all unlikely that William later named his first American-born son John in honor of his brother. The second certificate of note, and of more direct genealogical interest to me, is that of William Aylard — not William Aylard, my great-great grandfather, nor even his father; but my great-great-great-great grandfather! He lived to the respectable age of 81, dying on 29 December 1840 in Fordham. He, too, had been a carpenter, so clearly there was something of a family tradition in the trade. The certificate states that he died of Enteritis, or inflammation of the bowels. The third certificate is particularly sad, of two-week-old Martin Aylard, who died of "Debility" (lack of movement) on 27 September 1840. I do not yet know his relationship to my direct line, if any, but the fact that his father is named William and that the family lived in nearby Kirtling may suggest a connection. 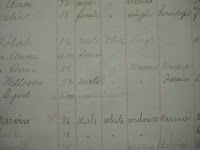 Research note: I am conducting an ongoing review of every Aylard listed in the Birth/Marriage/Death (BMD) indexes for England, beginning in 1837 when the keeping of official records was first mandated. I record these entries in a research log, and note particularly any listed in the district of Newmarket. This district contains the two small farming towns of Soham and Fordham from which my direct-line Aylard ancestors came. Every so often I will order copies of Newmarket entries, which usually prove to be individuals I know to be closely related. Those who are not, I am very confident, will eventually also prove to be closely related, though perhaps less so. William Aylard worked with his hands as a carpenter in the small farming town of Soham in Cambridgeshire, England, where he also tended a pub. Life in the quiet countryside was no doubt typically uneventful, but his life in 1851 was about to be turned upside-down. 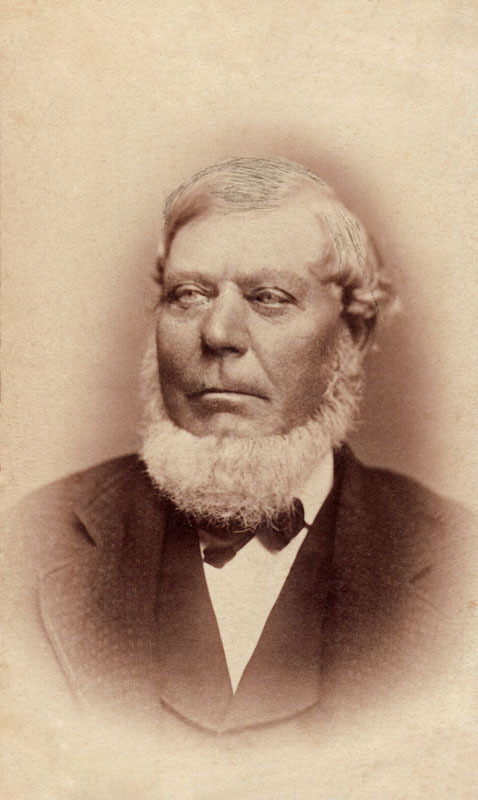 He was born in 1814 in a district of greater London known as Stepney (or Stepney Green, as it is recorded in one census document), although both of his parents were apparently native to Cambridgeshire some distance away. He was named William, as were his father and grandfather. Although born in London, William lived in Soham throughout his youth by all indications, and any connections to possible family in London are not yet known. When in his early twenties, he married Ann Darnell, apparently in the months or years just before civil registration became mandatory in 1837. She gave birth to his first child, Ann, in the Spring of 1839. Before the end of that year, however, his wife died of the wasting disease then known as Consumption, which is now called tuberculosis. His young daughter went to live with his dead wife's parents. A few years later he married his second wife, Fanny Levet. She gave birth to two sons, both named William (the first died in infancy), and a daughter named Sarah (likely in honor of both of their mothers who shared the name). In 1851, after nearly ten years of marriage, Fanny also contracted Consumption and died. Whether Fanny's death was an impetus, or whether William fulfilled what had been a mutual intention is not known. But shortly after his second wife's death, he left England with Sarah and young William and immigrated to the United States. Family stories indicate that Sophia and David came to America aboard the same ship as William and his two children, and that she even tended to an apparently ill-stricken William during the trans-Atlantic crossing. Almost certainly, William and Sophia must have known each other long before they journeyed to the United States, having lived in the same small town all of their lives. Perhaps being aboard the same ship gave opportunity to renew or deepen an existing acquaintance. Or perhaps they knew each other well and were part of a joint plan to begin a new life in the New World. Further research may yet show that many left Soham for the United States at that time as some surnames that appear in England census documents for Soham also later appear in United States census documents in proximity to William and Sophia. The couple — apparently married shortly after their arrival in the United States — settled with their blended family in the small community of Palmyra, New York, and there gave birth to several children, including my great-grandfather, John Aylard. 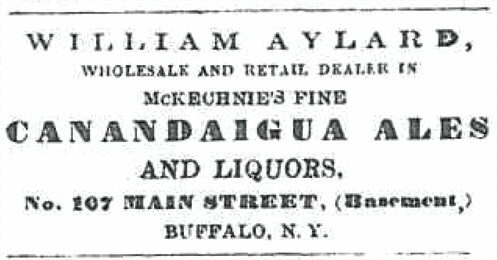 There are some indications that William may have attempted an alcohol wholesale and retail business in Buffalo, New York, for a short time, perhaps relying on experience he had gained by running his pub in England. However, by 1860, on the eve of the United States Civil War, William moved his family from New York to Brunswick, Ohio, where he and Sophia lived for much of the rest of their lives. William died on 17 February 1886 at 72 years of age, and Sophia died on 21 August 1889 at about 64 years of age.